Normally we would just introduce the short vowel sound (i as in igloo). There aren't a lot of words that start with the short vowel sound so we will also learn i as in ice cream. Cut out the letter "I" with your green foam paper. Add a tail, red tongue, and googly eyes. Color your dry noodles by mixing food coloring and rubbing alcohol. I don't measure, I just kinda "eye it" until I get the color I want. Mix in a large bowl or bag and lay out on old towels with newspaper underneath and let dry overnight. After you put the noodles in the bottles, make sure and glue them shut to prevent choking. Remove small bag, unseal, and it's done! Letter Hunt: Your letter bucket is filled with insects, ice cream, iguanas, igloos, instruments, inchworms, etc. 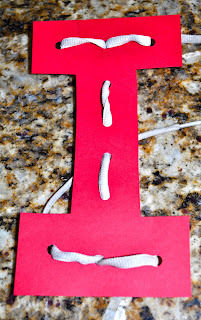 Make the letter "I" with construction paper and punch some holes\. 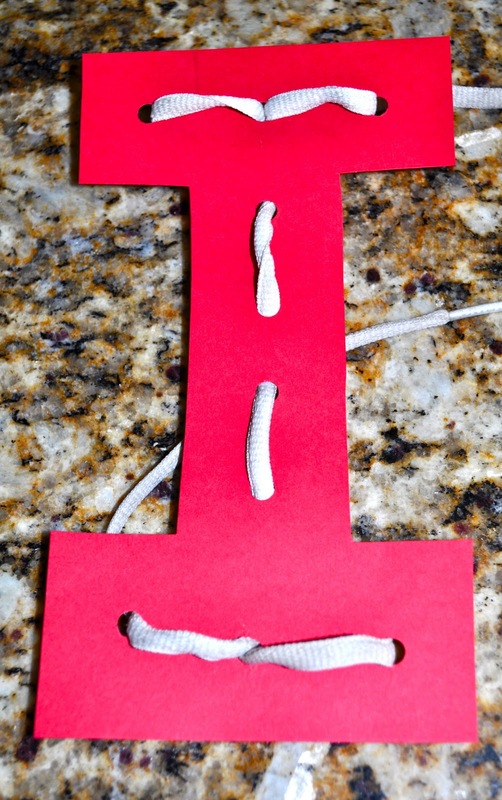 Let your little one lace up the holes with a piece of yarn or shoelace. Use notecards to write different items around the house for your smartypants to begin learning sight words.